Since the government doesn’t have the majority it needs to push through any kind of Brexit by itself, Brexit — if it is to happen — is going to require support from MPs in other parties, and not just the DUP. Given where the LibDems and nationalists are, that seems to mean that without some kind of Labour support, Brexit can’t happen. I want to stop Brexit. So as a Labour Party member I worry about the different ways in which Labour might enable Brexit, or “midwife” it in the jargon. The complexity and chaos is clearing a bit now and we can see I think the main ways in which midwifing might happen. 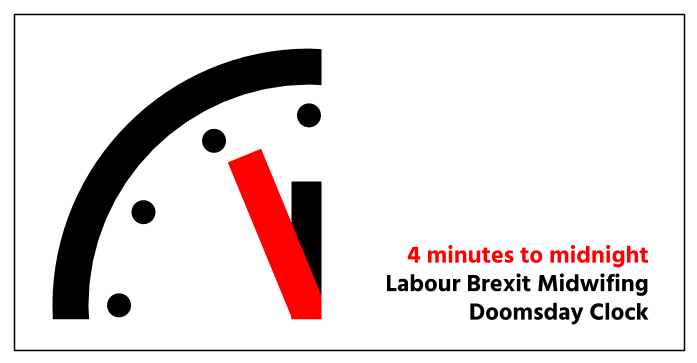 This article sets out how I see the possibilities and also introduces the Labour Brexit Midwifing Doomsday Clock, which summarises the picture and indicates how close we are to catastrophe. The first and most obvious form of midwifing is for Jeremy Corbyn to somehow get into Number 10 and do what he says he wants to do, which is to go to Brussels and negotiate a Labour Brexit. This could happen via a general election or a reconfiguration of power among the existing MPs, as in 1940. The second kind of midwifing is for Corbyn to strike a deal with Theresa May and for Labour to vote in Parliament for a revised form of her deal. If Labour sticks to the policy agreed at Conference, this should be impossible. That policy requires “…a relationship with the EU that guarantees full participation in the single market”. Being in the single market entails freedom of movement and is obviously unacceptable to May (and much of her party). However, the text of the Labour amendment in the House of Commons submitted last week puts forward a different position. It calls instead for “…a strong relationship with the single market…”. The shift in wording may seem slight, but it’s the difference between being inside and outside. The amendment does not entail freedom of movement. The strategic ambiguity that Corbyn has pursued over Brexit means it is always hard to be certain of its position, and requests for clarification are rebuffed. Could this just be sloppy drafting? I think that’s very unlikely, partly because the amendment surely was scrutinised by the Labour leadership as closely as any amendment in history, and partly because a number of other indications in recent days show how determined leading figures are to keep the door open to Labour supporting “the right kind” of Brexit. Ignoring the policy set at Conference, Len McClusky told the BBC, “had Jeremy Corbyn won the general election we would now be coming out of Europe with a proper deal that would unite the nation … that’s where we’re going to and that’s what we are gonna fight for”. Ian Lavery, the party’s national campaigns coordinator, reheated the “divisive” argument against a second referendum. And Jenny Formby, Labour’s general secretary, attempted to crush grassroots (and hence pro-Remain) attempts to get the NEC to discuss Brexit at its upcoming meeting. To sum up, I don’t think this kind of midwifing can be discounted. While Corbyn has made a show of not accepting May’s invitation to talks at Number 10, the substantive move of the amendment says the opposite, that he is willing to compromise with May at the expense of the party’s Conference policy. The third kind of possible midwifing would come later in the process, via a second referendum and Labour orchestrating a defeat for Remain, either by keeping Remain off the ballot or by explicitly supporting Leave or by running a lacklustre, passionless campaign like last time. A fourth kind of midwifing takes place a step earlier in the process. It consists of keeping No Deal on the table and taking Delay off it. That would leave the House of Commons with a choice only between two different kinds of Brexit, No Deal and May’s Deal. The mechanism for achieving this is to kill anything that takes No Deal off the table, which as things stand is Yvette Cooper’s amendment. There are then two ways in which this can be achieved. The first is for the Labour Party to refuse to support the amendment. The second is for the Labour Party to whip behind the amendment but for enough Labour MPs to rebel to see the amendment defeated. And in this second option, there are again two variants: the one in which Corbyn really tries to stop the rebellion and the one in which he tolerates it with a nod and a wink. This does not exhaust every possible form of midwifing but it does seem to me to be the main ones. Please comment below if you think I’ve missed something important. Now to the clock. This is based on the Doomsday Clock run by the Bulletin of the Atomic Scientists and which has been used since 1947 to indicate the risk of nuclear war. The closer the hands are to midnight, the closer we are to catastrophe. There are many different ways in which nuclear Armageddon might come about; the scientists consider them all and as the military and diplomatic situation changes, they move the hands back or forwards. I will use the Midwifing Clock in the same way. I’ll look at the various possibilities, how the political situation is evolving, how proximate the threat is and then move the hands back and forth. Hopefully the clock will remain useful for more than a week. 2. Publicly spelling out that any rebels will be punished with the utmost severity — for example by being prevented from standing for Labour at the next election. We have seen some noises that 1 is likely but nothing about 2. There is still time, but it is rapidly running out. I am therefore moving the clock forward from seven minutes to midnight to four minutes to midnight. We are in my view entering a period where there is an extreme and catastrophic risk of Jeremy Corbyn midwifing Brexit. It doesn’t have to go to midnight. There is still time for Jeremy Corbyn to pull back from the brink and to avert disaster, both for the country and the Labour Party.